Data center facilities require a significant amount of electricity to power the plethora of technologies and systems utilized for housing data. However, in today's drive toward green IT reduced power consumption, owners and operators of these facilities seek ways to decrease the amount of energy consumed within their technologically advanced infrastructures. According to the Federal Energy Management Program, a data center consumes about 100 times more energy than a typical office building. While many may attribute this usage to the increased amount of information technology equipment, energy used to power this hardware can amount to less than 15 percent of total electricity utilization. Additionally, the Environmental Protection Agency found that data centers comprised 1.5 percent of the total amount of electricity consumed by the United States in 2007. That number was projected to reach 3 percent by 2011. This will create the need for 10 additional power plants in the nation, stated infoTECH contributor Ashok Bindra. Overall, about 10 percent of global power resources are utilized by organizations within the IT sector, stated the Register. Although many data center operators have worked to improve the energy consumption levels of their facilities, Maxim Integrated stated that most of these efforts have been directed toward IT components and equipment. 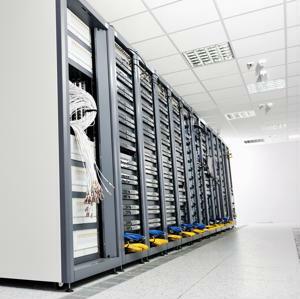 One often-overlooked energy consumer is the server room cooling system. Although data center IT components must be kept cool for a variety of reasons, temperature monitoring of these systems can provide ways to improve a data center's electricity levels. In order to keep servers and other hardware items functioning properly, experts recommend that data centers be kept within humidity levels of 65 to 80 degrees Fahrenheit. The range for the environment temperature varies, but many agree that keeping the server room between 68 and 75 degrees can prevent systems from overheating. While it is important to keep servers in the optimum temperature range, a cooling system can be one of the highest energy consuming arrangement in a data center. For this reason, temperature monitoring technology can allow data center operators to keep these systems at the higher end of the range while still ensuring their optimal functionality. A high temperature alarm can alert key personnel if the interior temperature level reaches too high a mark. When systems are maintained at higher temperature levels in the recommended range, machines are kept in good working condition and less power is consumed by the cooling system, so finding that sweet spot and staying there is imperative. Bindra also stated that sensors can be placed in other parts of the data center facility besides just in the server room. The temperature can be maintained at a higher level in places where IT system cooling is not a factor, further decreasing energy consumption. For example, the lobby and office space of the data center does not need to be the same temperature as the server room. Offering this level of control over the temperature of the facility can improve visibility over power usage as well as opportunities for reducing usage.